Saudi Arabia's Foreign Minister Adel al-Jubeir, left, shakes hands with Chinese President Xi Jinping after speaking during the opening session of the 8th Ministerial Meeting of the China-Arab States Cooperation Forum in Beijing, July 10, 2018. This article is the first in a serious of four that will explore the nature of China’s growing presence in the Middle East and what China’s increasing leadership means for the region’s economic, humanitarian, and security situation. By virtue of initiatives like the Belt and Road accompanying America’s stagnating influence in the region, China is emerging as a leading power in the Middle East. However, the dynamics of China’s presence in the Middle East have traditionally been afforded somewhat sparse focus compared to Beijing’s involvement in other regions. Therefore, many observers are now grappling with the question of how China’s growing involvement will play out, especially as Beijing seems set to play a crucial role in issues like post-conflict Syria. To this end, it is instructive to start by appreciating the context of China’s recent history in the region, and delineating the major trend lines that have driven Beijing’s presence thus far. Throughout the Mao era, Beijing’s foreign policy was overwhelmingly ideological — China’s relations with particular states were largely determined by that state’s relationship with Washington or Moscow. However, upon the onset of the Deng Xiaoping era in 1978, this ideological approach was eschewed for a more practical approach of basing state relations upon trade and economic opportunities in order to support China’s colossal modernization program. Accordingly, Beijing began to establish diplomatic relations with states across the Middle East, and built modest economic ties in the form of arms sales and the export of Chinese laborers. However, as the Cold War was still raging, with the Middle East being a key area of contest between the USSR and the United States at that time, there was no room for a third external power to throw its weight around. As such, the Middle East remained on the periphery of China’s foreign policy agenda for much of this period. As the Cold War began nearing its end, and China’s modernization program brought increasing power, Beijing became more interested in increasing its influence in order to compete with the two extant superpowers. The end of the Cold War saw China’s approach to the Middle East become not only about a push for increased global status, but also about consolidating deeper economic ties to facilitate the escalation of China’s economic expansion. China’s expansion of its economic ties in the Middle East was supported by Beijing having established diplomatic relations with all states in the region by 1992. Additionally, the progress of the Arab-Israeli peace process at this time enabled economic cooperation to gain focus as a priority for the region’s states, and Beijing pushed to take advantage of this opportunity. A further key development in China’s economic presence in the region was the event of China becoming a net importer of petrochemical products in 1993. As China’s economy took off through the 1990s, its petrochemical relationship with the Middle East proliferated accordingly. Throughout the remainder of this period, China’s relationship with the region was largely defined by its insatiable need for Gulf petrochemicals to fuel its rapid growth. Since the beginning of China’s “reform and opening-up” period in 1978, Beijing self-identified as a “bystander” and “free rider” in the Middle Eastern region, with China’s presence being solely defined by reaping maximum economic benefit. However, this strident avoidance of any political involvement in the region began to recede in 2008, when Beijing dispatched three naval vessels to participate in multilateral counterpiracy operations in the Gulf of Aden. This building security presence continued during the 2011 Libyan Civil War, when Beijing responded to growing domestic expectations that the military protect its expatriate populations by dispatching People’s Liberation Army air and naval units to evacuate the 35,000 Chinese citizens located in Libya. A further notable development in this vein included China’s contribution of 700 peacekeeping troops to the UN force in Sudan by the end of 2012. The salience of this – and such developments as the contribution of several hundred engineering and medical personnel to the UN Interim Force in Lebanon – is that it calls into question the Chinese foreign policy pillar of noninterference in the internal affairs of other developing states. This is one of the Five Principles of Peaceful Coexistence that Beijing declared at the 1955 Asian-African Conference of non-aligned states – a policy paradigm that it has proudly promoted ever since as evidence of Beijing’s non-hegemonic and benevolent ambitions for the developing world. While China’s security involvement increased in this period, this did not represent a departure from Mao’s assertion that China’s engagement with the Middle Eastern region was driven purely by its national security interests, and not by an ideological desire to intervene in the region’s vast problems. As China’s energy-related presence grew, a secure region became increasingly important – energy needs being a key pillar of Chinese national security. China’s economic relationship with the Middle East underwent its most significant transformation yet with the advent of the Belt and Road Initiative (BRI) in 2013. 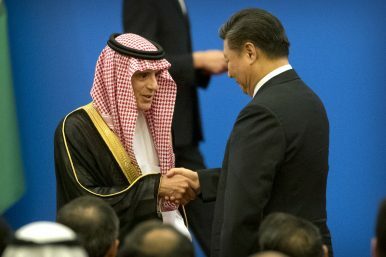 Reflecting the centrality of the Middle East to BRI designs, the Middle East was designated as a “neighbor” region by Beijing in November 2013 at the Third Plenary Session of the 18th Central Committee of the Communist Party of China, meaning that it now falls within Beijing’s top-priority geostrategic zone. Countries are typically ranked by importance by China according to where they fall within four concentric geographic circles protruding outwards from the Middle Kingdom. When the Middle East was re-imagined within the closest concentric circle outside of China, it became a focus of increasingly proactive Chinese diplomacy, primarily exercised through the BRI framework. The prioritization of the Middle East within BRI – itself the central feature of contemporary Chinese diplomacy – has seen China become the largest trading partner of the Arab League and Iran, as well as a key partner of Israel. Looking Ahead: Whither the Non-Interference Paradigm? Despite Beijing’s natural inclination toward a hands-off approach, the sharp upward trajectory of China’s growing economic involvement in the Middle East makes it a fait accompli that increasing political involvement will follow. Indeed, Foreign Minister Wang Yi admitted as much, stating in 2014 that “China’s political role in the Middle East will only grow. There is no way back.” Beijing’s focus in the Middle East is now centred on energy security and enhancing its great power status in the region by leveraging its economic power to balance against, but not directly oppose, U.S. influence. The challenge now for China lies in achieving these aims while maintaining its reputation as a neutral broker and without becoming entangled in the region’s intractable political stand-offs. *Nicholas Lyall is an Amman-based researcher, where he is leading a research project on the opportunities for China’s increasing role in the Levant to address the region’s humanitarian and economic challenges. He can be contacted here.